As things have quietened down somewhat, my wife, Susanne, and I managed to skip off for a few days R&R this month. Despite being the morning after the ‘big wash’ we did manage to get over Tregony bridge (which was completely impassable only hours before due to flooding) and made it up to Pembrokeshire safely. We had a delightful stay at (dog friendly) Llys Meddyg and enjoyed three days of walking Totty on the beach and eating way too much. Ed, the owner of this lovely hotel, took us out to a most extraordinary pub we have ever visited. It was in the nearby valleys and was simply a sitting room with a glass partition which you had to bang on until someone came to serve you. It was decorated like an early 1900s living room with hard slate floor, ancient age-encrusted photos and a dart board which looked like it hadn’t been used in a decade (which, we found, was about right), and the obligatory dead daddy-longlegs hanging from the ceiling. One solitary beer on tap, a couple of spirits, and a card of peanuts, and that’s your lot! The owner, a woman in her eighties, came to join us in her ‘front room’ (preceded by her dog, Sam, who would open the doors and wonder in all by himself). Sitting by the small log burner, she chatted to Susanne, Ed and I before two other locals turned up who we started a conversation with, enabling our host to aptly nod off. The whole experience was lovely, real and earthy, although somewhat odd… but we really enjoyed it. But talk about coincidence. Not only did we meet two people who were also staying at our hotel who – we found out on the last day – are great friends of our own Hilary Stock. Then we find out that Ed’s lovely wife, Cecilia, had many wonderful memories of Portscatho herself! Her grandparents owned the house in Froe which our friends, John and Claudia, bought from them a coupe of years ago… what a small world, eh? I guess the moral of the story is: be courteous to everyone you meet. You’ve just no idea how close you are to someone you know, or who may know you! Anyway, to use Sammy Cahn lyrics (immortalised by Frank Sinatra) “It’s so nice to go trav’ling, but it’s oh so nice to come home.” So we’re delighted to be back, once again, in the loving embrace of our coastal village. Now, before I get on to what’s new in the best gallery of all (probably! ), Christmas is no better time to remind you about our popular Contribution Buying service. If you’d like to buy one of our fabulous works for your loved one – or even for yourself – why not make a deposit and allow friends and family to contribute towards the rest this Christmas? We’ll send you a link that you can forward to your friends/family. It’s a great way of getting what you/they’d really love this Christmas, and it doesn’t cost a penny more! So what is new in the gallery? Well I’m delighted that we’ve had yet another fabulous artist join us this month. 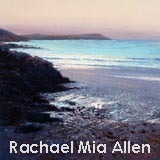 Rachael Mia Allen bought in with three pieces painted especially for us/you… and they’re stunning! 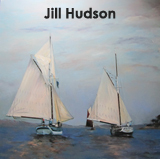 Have a look at her page to see the lovely works for yourself. 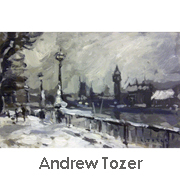 We’ve had five stunning new pieces by the mighty (in joke) Andrew Tozer, too. One was sold almost immediately ad the other two are creating much interest. We also have two unusual (for us) winter London scenes by him, so I hope they’re of interest. The lovely Jill Hudson has bought in a fabulous new meter square piece, too. It replaces the one we sold earlier in the month and we already have much interest in that as well, so don’t miss out if you, like me, are a fan of her work. Lynn Golden has been her usual generous self. She came to a customer’s rescue and repaired a piece of her work which had some unfortunate damp damage… she’s sooo lovely and giving! And she bought in some new pieces for us, too, so thank’s muchly Lynn! 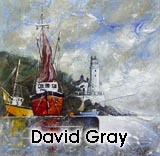 And if that’s not enough for you, David Gray has done some stunning new work for us. After we sold the last of his wonderful unusual ‘sculptured’ artwork, he’s rushed to get some replacements in for us/you. And we visited him for this month’s Podcast, as well, so you can get an insight into how he creates his lovely work. So there it is, folks. I’ll be delighted to get this extremely itchy moustache off today after successfully enduring Movember for the cause. Unfortunately it’s there for prosperity now, in this month’s Podcast, so sorry you have to endure the 70s Mexican Drug-lord look, me deers! Anyway, have a wonderful Christmas and New Year and I hope to see you in 2013… if not before! I had a revelation this month!